Did you hear the one about Microsoft and the patent lawyers? They have to stop selling Microsoft Word! No, seriously. Last week a judge found Microsoft guilty of patent infringement and ordered the company to stop selling Microsoft Word. Can we even imagine a world without Word anymore? I think this case presents something of a Rorschach test for nerds. (Rorschach tests are those ink blots you’re supposed to describe to the psychologist. Everyone sees something different.) Some people jump up and down and clap their hands on hearing the news, shouting “yippee” and gloating unwholesomely that Microsoft has lost a patent-infringement case. Hooray for the little guy. Stick it to The Man, etc. Other people roll their eyes, wring their hands, and wonder how we came to live in a world where word-processing software can suddenly be declared illegal and banned from the marketplace. The real geeks wonder what the patented technology is all about and whether they might be unwittingly using it, too. Where you fall in this spectrum of responses says a lot about how you feel about technology, competition, practicality, and politics. If your first reaction was gleeful delight at Microsoft’s misfortune, I might gently suggest that you’re just prejudiced against Microsoft, and the facts be damned. Maybe there’s merit to the case, and maybe there isn’t – but how much did you bother to find out before condemning the beast from Redmond? On the other hand, if your first reaction was to criticize the courts and the idiotic judge, it’s time to wonder if you’re being irrationally biased in the other direction. I’ll be the first to admit that I don’t know the merits of this case. I can read the patent as well as the next guy (it’s US 5,787,449), but I’m in no way qualified to say whether Microsoft’s products infringe that patent or any other. That would require a level of research and dedication that I’m not willing to commit. Maybe the plaintiff is just a patent troll, extorting money from deep-pocketed companies. But patent trolling is legal, albeit distasteful, so what would be the problem with that? Maybe the patent is invalid. Maybe it’s the greatest invention since canned beer. Maybe the whole case is an indictment of the American patent system. Again, what you read into it likely says more about you than about the technology involved. I will say this: I think our current system of patents is, shall we say, flawed. As inventions get more complex, it necessarily becomes more difficult to review them. Consequently, the patent-approval process is both lengthy and error-prone. Patent “justice” is slow to be meted out, diluting much of the value of patents. And legal rulings such as this one appear random to the outside observer (that is, the majority of us with no inside knowledge of the specifics of a given case), which reduces predictability and discourages investment and development. Whether patent rulings are indeed just and fair is almost beside the point – they appear capricious to the industry at large and this slows progress, sows doubt, and encourages abuse. You can’t play the game effectively if you don’t understand the rules or trust the referees. In this particular case, the techno/legal pundits say the injunction against Microsoft will be overturned before it even goes into effect. The net effect to Word users everywhere will be zero. The world will resume spinning on its somewhat wobbly axis, and legal equanimity will be restored. Until the next time. We all know the 8051 is a small microcontroller. It’s a little bitty 8-bitter, but very popular around the world. The 8051 might just be the world’s most-popular and best-supported microcontroller ever. But just how small is it? Try 4 mm2 (just 2 millimeters on a side). 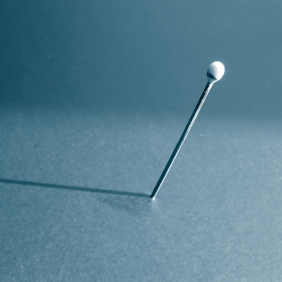 That’s head-of-a-pin small, don’t-swallow-it small, hide-it-under-a-paperclip small. It’s probably smaller than any resistors on the same board. This little beauty comes from Silicon Labs and it’s called the C8051T606. The chip sells for about 50 cents in reasonable quantities and comes in an itty bitty surface-mount package. Don’t lose yours. Surprisingly, the chip runs at about 25 MHz, so it’s not even a watered-down wimpy device. It’s also got I2C and UART interfaces, so it can talk to the world. In fact, you might consider using it purely as an I2C-to-UART bridge device, converting one type of serial interface to the other. Nobody but you has to know it’s actually a microcontroller. If you’re into bigger packages and faster data rates, maybe a new device from MosChip will pique your interest. It’s also a bridge chip, connecting PCI Express to USB 2.0. In other words, it’s the perfect chip for adding USB ports to a PC (or PC-like embedded system). On one side you’ve got a PCI Express interface, and on the other side you’ve got four USB interfaces. Simple in concept but tricky in practice. It’s funny how bus interfaces have become so complex that they’ve become design hurdles in their own right. If you’ve tried designing a USB interface from scratch, you know what I mean. It’s that complexity that makes USB “universal” and PCI Express so, um, “expressive.” Chances are you don’t really want to design the interfaces yourself; you’d rather just connect and go. That’s where a chip like this comes in. It handles all the state information, bus transactions, and related esoteric. It’s even got built-in drivers for both interfaces so you don’t have to worry about current-sink, timing, or skew. The USB side handles normal USB 2.0 host duties, or you can configure it for USB On-The-Go (OTG) mode. In the latter mode you get two host ports and one OTG port; the leftover pins can be general-purpose I/O or an “old school” ISA bus interface. The chip, which MosChip calls the MCS990, costs just over $12 in small quantities. It comes in a 128-pin LQFP, mostly because it needs that many pins for all the I/O.